Tucked against the north side of St. Thomas is the world’s most perfect white sand, crescent shaped beach, known as Magens Bay. 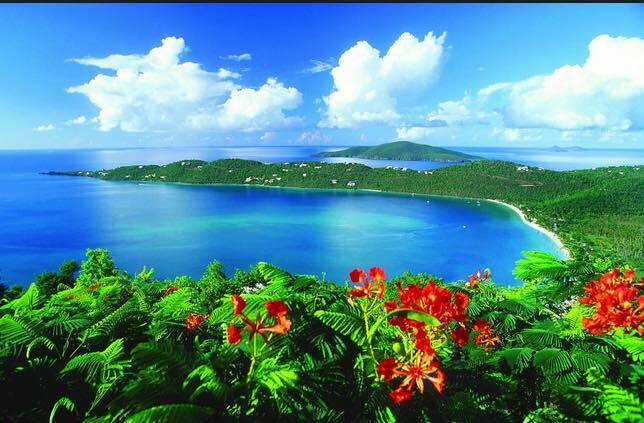 Magens Bay has been voted over and over again as one of the world’s top ten most beautiful beaches, offering a mile long gentle crescent of soft white, pebble-free sand, calm waters and a beautiful view of the mountains that protect this bay from erosion and strong waves. Magens Bay Beach has three things that you probably expect to find at a top Caribbean beach-—silky soft sand, stunningly clear water, and palm trees that sway in the tropical breezes. Magens Bay is known as a “swimming” beach, with warm, calm, crystal clear waters protected on both sides by the Petersburg peninsula and Tropaco Point to the west. Magens Bay sits at the end of this deep, shallow bay that is usually calm enough for swimmers of any age. The white sandy bottom stretches forever, and there are virtually no reefs, so snorkeling here is limited. What isn’t limited is a clean, well kept stunning beach with lots of services for its users. Admission is just $4 per person, or you can swim in from the boat if you swim to shore. This is a great beach for a stroll, or you can sip a cocktail while floating in the water—the wait staff will come to you! Magens Bay is now it’s own park, featuring a walking trail, arboretum, coconut groves, picnic tables and campsites. There’s even a kayak, paddleboat and sunfish rental stand where you can rent by the hour. And of course, there’s an extensive snack bar, cocktail bar and souvenir shop! Restrooms and showers round out the services available at Magens Bay. When you come into Magens Bay by boat, you’ll have a point of view very few people get. It’s absolutely amazing. From the mouth of the bay, you’ll cruise past hills rising from the sea, covered in colorful flowers, shrubs, trees, and some of the most amazing homes you’ve ever seen. It will take a little while to get close enough to the beach to swim in, because the bay is really deep. One of the best parts of Magen’s Bay is that the focus is on swimming, so the lifeguards take great care to be sure boats stay back a good distance. That big lunch you had? No worries—you’ll swim off the calories on the way to shore! Grab a drink and enjoy the peaceful beauty of Magens Bay!